This Paleo roast chicken recipe is such a perfect example of an economical, simple home-cooked meal. It’s flavored with simple herbs, lemons, and a little butter or ghee and it’s just the type of recipe to bring the whole family together. I was at the grocery store the other day lamenting how much money I was spending. I whole heartily believe that eating healthy is an investment in my health, and well worth the extra money…but that doesn’t mean that I like it. Anyway, I came across a whole organic chicken on sale for a fabulous price, so I grabbed it and the wheels in my head started turning on ways to cook it. The good deal instantly changed my mood, and I headed to the produce section to find fresh herbs and lemons on sale…perfect. I knew what we were having for dinner the next day. 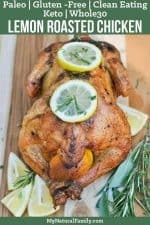 Not only is whole chicken extremely cost-effective, but it is also super easy to make. Trust me, it is super easy, and looks WAY more intimidating than it actually is. It is the perfect family meal, and honestly, I don’t know why I haven’t made it more often in the past. For those of you that are not fans of chicken skin – no worries – it helps keep this chicken super-moist while cooking, and easily comes off when you are ready to eat it…so don’t let the skin on this Paleo roast chicken recipe scare you. As for our house, we all fight over every little scrap of chicken skin. Does anyone else have a love/hate relationship with the grocery store? I like going to the store (especially when I don’t have my kids with me). Some of my recipe inspirations come from the grocery store. I like to browse and take my time – maybe I am weird…but I don’t like going with my kids (I love my kids, just not at the grocery store). I also really hate paying my grocery bill. Groceries take up a big part of our monthly budget, which isn’t the most fun way to spend money – clothes, travel or entertainment would be way more fun. Honestly, I could trim down my grocery bill a bit, but there are things that I am not willing to compromise on. The truth-of-the-matter is eating healthy costs more money – it’s just how it is. I would save a lot of money if I bought bag cereal for breakfast, boxed macaroni and cheese for lunch, and hamburger helper for dinner. Or – ramen noodles. If only we could just live off ramen. Just think how much money we could save . . . I always compare organic produce prices to non-organic prices. If the organic is comparable I buy organic, if it is way more money I don’t (I just wash it really well when I get home). I wish I could eat 100% Paleo all the time, but with teenagers and expensive medical bills, it’s just not always totally practical to always eat organic. I can be picky about my produce, but I am way more picky about my animal products. I always buy natural, hormone-free, and antibiotic free animal products, and will buy organic if it is available, even if it is significantly more money. I find I save money on animal products when I buy them in bulk. I buy my grass-fed beef products from a local distributor, I will also stock up on organic meat when it goes on sale (which it does from time-to-time at my local grocer). I can’t always get grass-fed beef for a good price locally though, so that’s why I buy some of it in bulk online and get volume discounts. I love Costco. Costco has a lot of natural organic choices that are significantly cheaper than other stores. The first example that comes to mind is coconut oil. You can’t beat the Costco price on coconut oil. There are some things I only buy for myself (does that make me a horrible mom?). For example; I buy myself almond flour crackers at Costco and I don’t let my children touch them. They are way too expensive for kids, but sometimes I just need a cracker. My local grocer sends coupons in the mail, which are usually for things I commonly buy…so I use them. Otherwise, I don’t clip other coupons. I don’t have time, and usually, they are coupons for things I never buy. I mean, Paleo products are rarely in boxes or cans, which is mostly what coupons are for. I have a small garden and I shop at the farmer’s market during the summer. A garden can be a HUGE money saver. If you have a big garden – I am super-jealous, and your grocery bill is probably smaller than mine :)! My biggest money saver is we rarely go out to eat. We almost never go out for lunch and eat out for dinner only about once every other week. I have a hard time justifying eating out when I spend so much money at the grocery store…but there are days, when making dinner is not appealing, and the local cafe is calling my name :). Plus, my choices are a lot more limited eating out when I’m on the Paleo diet – that and “normal” food just doesn’t taste nearly as good as it used to even when/if I cheat. That is my list of how to eat healthy on a dime. I am sure I am missing something, but if I got into all the nitty-gritty details, I would put all of you to sleep. What do you do to save money on the Paleo diet? Have you ever make homemade a Paleo roast chicken recipe before? Paleo Chicken Recipes for Any Meal Anytime, Anywhere! 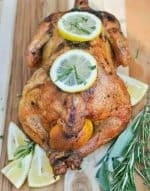 This lemon garlic herb Paleo roasted chicken is simple, healthy, and cost effective. It is perfect for family dinner. This smells wonderful while it’s roasting!